ASU nanotech firm wins big at New Venture Challenge entrepreneurial competition. ASU student start-ups tackle language learning, better snowboard bindings, more. A nanoparticle-coating systems company was the biggest winner in the New Venture Challenge entrepreneurship competition at Arizona State University. LN Tech won $45,000 in cash at the competition. Firth, who received his bachelor’s and master’s degrees from ASU, is partners with Zachary Holman, an assistant professor in the School of Electrical, Computing and Energy Engineering The School of Electrical, Computing and Energy Engineering is part of the Ira A. Fulton Schools of Engineering.at ASU. “I guess we’re really going to do this now,” Firth said of the one-day windfall in investment money. LN Tech was one of four finalists in the inaugural New Venture Challenge, and everyone won something. The other finalist companies were LetsChat, a mobile app that connects native English speakers with learners of English in China; HELOS, which has developed a hands-free snowboard binding; and Desert Bee, which created a data-management platform for preschools. The competition was for graduate students, and each team had to include at least one ASU student who owns at least 10 percent of the company, according to Sidnee Peck, director of the Center for Entrepreneurship in the W. P. Carey School of Business, which held the program in conjunction with the Ira A. Fulton Schools of Engineering. In January, student-driven companies applied to take a half-semester class taught by Scott Wald, a software entrepreneur who earned a master’s of business administration from ASU. Eight teams were selected to take the class, and they worked with Wald and other mentors on specific areas of entrepreneurship, such as financial forecasting and story pitching. Then the finalists were selected to compete on May 6. The panel of judges, all entrepreneurial experts, distributed $80,000 in cash awards and $63,500 in donated services such as design consulting and legal assistance. The funding came from a private donor, who has committed to two more New Venture Challenge competitions. Peck said that ASU will get equity in the winning companies. “So if they do well, we will do well,” she said, adding that any profits will be re-invested into the competition. Here’s a look at the four New Venture Challenge teams and their innovative products. Product: A delivery system for nanoparticle coatings, similar to an aerosol spray nozzle. Pitch: Firth and Holman have been developing their product since 2013. Firth said that the nanoparticle-coating business is a $14 billion market that people interact with daily. “If you have a smartphone, have you noticed that your fingerprints don’t adhere to the glass surface like they do to the windows in your home? That’s because your phone is coated with thin layer of nanoparticles that repel the oils from your skin,” Firth said. LN Tech has created a way to precisely apply nanoparticles to any surface. Firth said the technology is especially applicable to the new LCD display devices, but the company also works on products such as antibiotic bandages and energy-efficient window coatings. Firth said that the display industry will result in 225 million square feet of coating in 10 years. “That’s a lot of capacity we could get hold of. If we could grab just one half of one percent of that market, that’s $1.8 million per month in revenue for our company,” Firth said. Prize: $45,000 in cash, plus legal services and accounting consulting. Product: A mobile application that connects native English speakers with people in China who are seeking to learn English. The pitch: Chang Liu arrived from China to study marketing at ASU last summer when she realized that despite years of learning English, she could not speak it well. “After staying at ASU for one semester, my English improved very much, which made me realize that the best way to learn a language is to converse with native speakers,” she said. Liu created the idea of an English-language learning application and partnered with Megan Kirk and Elizabeth Oviedo, who both earned their masters of business administration degrees from the W. P. Carey School Business this month. In February, the team won the Sun Devil Igniter Challenge and a $50,000 prize. LetsChat will recruit a pool of native English speakers, who will upload video profiles to the app. People in China can choose a native English speaker and begin a conversation via text, voice or video. Users will pay an hourly fee to communicate one-on-one or in groups. LetsChat will take a 20 percent commission, and the English speaker will keep the rest. The team estimates that speakers can earn nearly $60,000 a year if they work 40 hours a week. The platform will differ from its competitors because it focuses on American-style English, includes a translation function and offers software that allows learners to track their accent compared with a native English speaker's. LetsChat has partnered with the ASU chapter of TESOL (Teachers of English to Speakers of Other Languages), which will allow students to use the LetsChat app to fulfill their 150-hour internship requirement. The team expects to begin testing the app this summer with plans to launch at the end of 2016. The prize: $25,000 in cash plus work space, consulting and networking services. Product: A digital platform that allows preschool teachers to efficiently communicate with parents and allows parents to see developmental data about their children. The pitch: Siblings Charlene and Robert Bruce are part of a team that developed a student information system platform in 2015 that can be accessed on a tablet by teachers and via a smartphone application by parents. Robert Bruce earned a master’s degree this month from ASU. He also works as a systems analyst at ASU. Robert Bruce and his sister, Charlene Bruce, are on the team that created the Desert Bee information platform for preschools. Photo by Charlie Leight/ASU Now. Typically, preschool teachers will record information several times a day for every child on diaper changes, naps and feedings. Those reports go home with parents. The website would be free for parents. The mobile app would cost parents $4.99, and a $6.99 premium version would provide an individualized database with at-home activities to boost specific skills for each child. Teachers can post video and photos, and administrators can track attendance, tuition payments and payroll. Desert Bee also will offer in-app purchases from vendors such as Scholastic and Amazon. Schools would pay $1,800 a year for the service. Desert Bee will pilot the app through the ASU Mary Lou Fulton Teachers College Preschool. The prize: $10,000 cash, plus product-development consulting and pitch coaching. Product: HELOS Heel Locking System is a step-in snowboard binding that eliminates the need to bend over. Pitch: The HELOS binding started as an ASU engineering capstone project for the team, which won the Spark Tank entrepreneurial competition in 2015. Existing hands-free bindings require specific equipment. The patented HELOS technology works with all boot and snowboard types. The team is looking to launch the product in winter 2017 after working on a 3-D-printed prototype and testing this year. HELOS is now recruiting beta testers to give feedback and will eventually sponsor snowboarding events as part of its marketing plan. The prize: design services consulting. A 32-year Arizona State University tradition continues as nearly 400 Hispanic students will take the Wells Fargo Arena stage on Saturday to be recognized for achieving their academic goals. ASU alum and former U.S. Representative Ed Pastor is also expected to attend this year’s convocation to present his namesake award, said Rhonda Carrillo, assistant director for the ASU Office of Community Relations. The convocation will also honor two outstanding students who have demonstrated scholastic excellence and leadership during their academic journey at ASU. The recipient of the Ed Pastor Outstanding Graduate award will be Katie Curiel, a master's in global technology and development major from the School for the Future of Innovation in Society. The other honoree is Grace Ordonez, who will receive the Cecilia Esquer Outstanding Undergraduate award. She’s graduating with a bachelor's in accountancy from the W. P. Carey School of Business. Phoenix native Curiel (left) made her mark at ASU through involvement in countless initiatives, to include being the founder of Women on the Move, an international network supporting Arab women to be empowered and find success in the U.S. and in their home countries. She also served on the advisory boards for ASU’s Cesar Chavez Leadership Institute and DREAMzone — a program that helps undocumented students. Curiel also interned with the U.S. Agency for International Development, helping to establish the world's first online platform for innovative global development initiatives. She mentored more than 20 of her sisters in Theta Nu Xi Multicultural Sorority both locally and nationally. Through the MasterCard Foundation Scholars Program, she also mentored two Ugandan women. Despite managing work and school while sustaining significant community involvement, Curiel maintained an impressive 3.9 grade-point average and garnered various scholarships and awards during her time at ASU. Scottsdale Community College transfer Ordonez (left) is the founding president of the Pre-Law Society at ASU. By working with the Sandra Day O’Connor College of Law, the W. P. Carey School of Business and various ASU alumni, the Phoenix native built recognition, support and connections for the group. In addition to amassing numerous scholarship and awards, Ordonez maintained a perfect 4.0 GPA and gave selflessly of her time by mentoring more than 100 students in rigorous accounting and economic courses. She also produced a series of YouTube tutoring videos to provide an around-the-clock assistance platform reachable by other students across the U.S. and abroad. Just over 2,100 Hispanic students graduated this semester, according to university statistics. 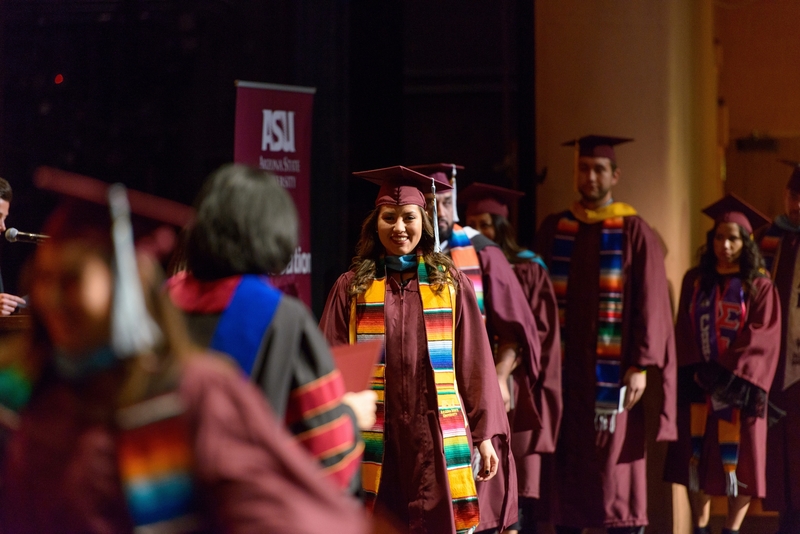 The ASU Hispanic Convocation is a signature event that honors the accomplishments and commitment of ASU’s Hispanic students pursuing higher education. Participation is open to all students graduating in the current semester. This semester’s convocation begins at 10:30 a.m. Saturday May 14, at Wells Fargo Arena on the Tempe campus.